This work makes available to readers without specialized training in mathematics complete proofs of the fundamental metatheorems of standard (i.e., basically truth-functional) first order logic. Included is a complete proof, accessible to non-mathematicians, of the undecidability of first order logic, the most important fact about logic to emerge from the work of the last half-century. Hunter explains concepts of mathematics and set theory along the way for the benefit of non-mathematicians. He also provides ample exercises with comprehensive answers. 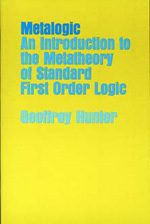 Geoffrey Hunter, now retired, has taught in the Department of Logic and Metaphysics at the University of St. Andrews, Scotland, and has also taught in Canada, England, the United States, and Wales.